So last night I decided to see what I could manage in the way of soloing some instances. I did a warm-up run of going into BRD. You see, I was still survival raid-spec'd and didn't know how well my pet would hold up without those nice tasty pet-tank hunter talents. Well, BRD was a walk-through. Not surprising since it's level 55ish. 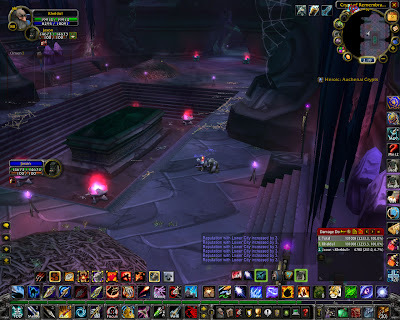 I thought about trying the level 60 40man raid Onyxia, but realized I'd probably learn more about pet tanking in a more typical instance setting. 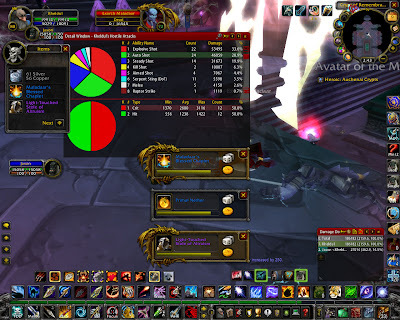 So I looked at what 3.0 thought I had never run and decided to try a BC heroic instance. 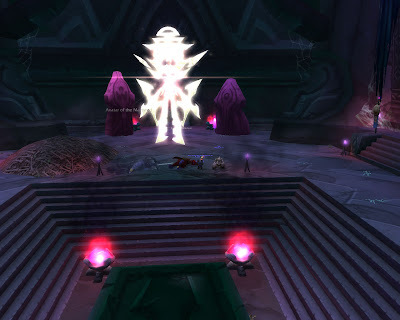 Heroic: Auchenai Crypts stood out. I didn't know it very well. I had run it a few times before 3.0, but I needed the achievement for regular and heroic. I'll admit, I was a little nervous. I didn't remember the instance or any gimicks in it. And I didn't want to re-spec just for this. Nor did I want to fail. What I learned made me think I may really make my secondary 3.1 spec a hunter pet tank spec. First up, I chose my thunderstomp pet. Then I went to my bank and fished out my Tier-5. I selected two pieces that seemed to keep my stats at the highest. These happened to be my Tier-5 shoulders and gloves. I made an Outfitter set for them. I emptied my bags of a lot of stuff and headed over. My first pull was fine. Single mob. My second pull resulted in I think four mobs. Not too challenging. Then I skirted around the mobs and pats. Generally, I'd pull as little as possible. I found some pats to be pretty ridiculously difficult. CC didn't work on maybe half of them. And when you think it's just a pat of two, suddenly four non-elites spawn. While they don't have much health, they do heal and do toss some real damage and DoTs. Thunderstomp wasn't happening fast enough. And to get it to happen more often I had to crit more and draw aggro more. It was not easy. I wiped twice on trash. When I saw pats of three on the bridge plus hidden knock-back guys, I found a corner and let them pass by. ... My thinking was if two become six then three become nine. Probably not quite right, but still easy enough to be patient with. So I was feeling a bit more confident, and worked my way in deeper. I died again from the trash and had a longer run back... and more waiting for pats, etc. And it was getting late. But I was motivated. And it was fun.